The revival of demand in the office property market is amplifying the clear signs of stabilization. That is expected to lead to a decline in supply and vacancy rates and a sideways trend for contractually-agreed rents. Supply and demand for office property is stabilizing thanks to the healthy economy, which has an effect on prices. However, in the long run, the need for additional office property is expected to decrease. The Swiss real estate market is benefiting from the economic recovery, which is also expected to continue in 2018. In terms of the office property market, it is also particularly true that the number of job vacancies is optimistic. This increased in the Q3 2017 for the sixth time in a row (+7.5% compared to the same quarter of the previous year). 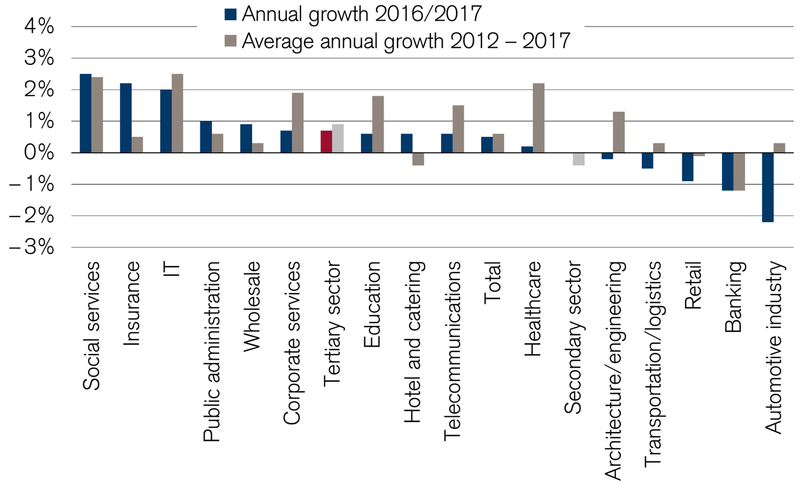 For traditional office-based sectors, employment in Q3 2017 rose by 0.5% compared to the previous year. The study by Credit Suisse on the Swiss real estate market for 2018 therefore forecasts a positive development of the office property market in the short term. In particular, the insurance industry was able to gain momentum, while structural change in the financial sector is not yet complete. However, there is major uncertainty in the long term. That's why modern forms of working continuously reduce the space needed for each employee. Flexible working hours and working locations lead to today's planners only factoring in 14–16 square meters (150–170 square feet) per employee when creating new office rooms. According to Property Market Analysis, a British real estate consultancy, the average office space per employee for the eleven largest office locations in Europe has decreased in the last ten years by 0.6% per year, or a total of 1.2 square meters (13 square feet). This trend is expected to continue. Additional demand for office property comes from the industry: Companies are constantly changing into service providers. More and more, not only are machines and equipment being sold, but services are also being provided. Although jobs are disappearing in the industrial sector overall, the demand for office workplaces there is growing. The Credit Suisse real estate study brings you up to date with the latest market developments and explores special topics of interest: What potential do residential high-rises have? Who will purchase real estate when the baby boomers have all retired? Who makes the decision when purchasing a home: men or women? And how does psychology sometimes play tricks on real estate investors? The development of the Swiss working population has a major influence on the office property needed. There are opposing developments here. On one hand, the baby boomer generation is slowly retiring. 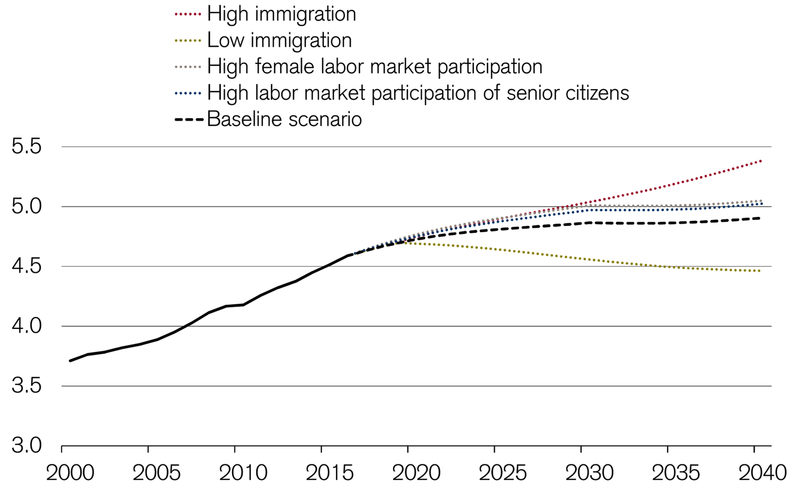 By 2029, the number of employed people expected to reach retirement age may increase to a record 42,500 people. At the same time, older employees are increasingly willing to work beyond the retirement age. From 2000 to 2016, the employment rate of the Swiss population for people between 65 and 74 years of age rose from 14.5% to 18.6%. During the same period, the employment rate for women between the ages of 20 to 69 also grew. In 2016, it reached a value of 76.5%, after being only 69.2% in 2000. Nevertheless, the rate for men is still significantly higher at 86.3%. The supply of office property is high like before, although the vacancy rate slightly declined again for the first time since 2011, which affects prices. If rental prices were declining over the last few years, then they are stabilizing now. Outside of the major centers, rental prices for office property have risen steadily since 2015. The authors of the real estate study expect this trend to continue, at least in the short term. However, the bottom line is that the consequences of demographic aging can only be offset to a limited extent through higher rates for women and seniors. 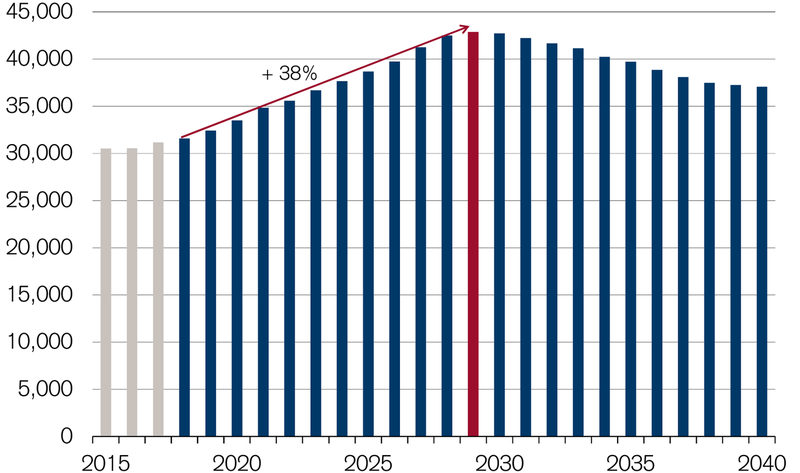 According to Credit Suisse estimates, average labor force growth is projected to decrease to 0.21% between 2020 and 2040, compared with 1.33% between 2001 and 2016. A migration balance of 40,000 people per year, which is about the average of the last few decades and about 10,000 persons below the migration balance of last year, has already been taken into account for this scenario. Depending on how high the migration actually turns out to be, the Swiss working population – and therefore also the demand for office space – is likely to develop more strongly or more weakly than in the baseline scenario by Credit Suisse economists. Do you have any questions concerning this topic?